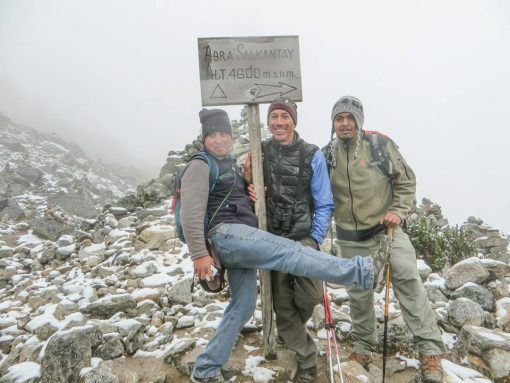 The Salkantay trek is the classic alternative to the Inca Trail, traversing high along the flanks of snowcovered Apu Salkantay, one of the highest peaks in the region, before descending into the cloudforest and high jungle near Machu Picchu. 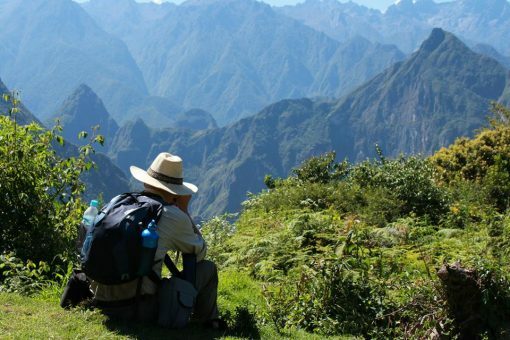 The scenery is dramatic, from high Andean peaks to a unique view of the backside of Machu Picchu, and then, of course, Machu Picchu itself. Not Sure What Trip You Want? 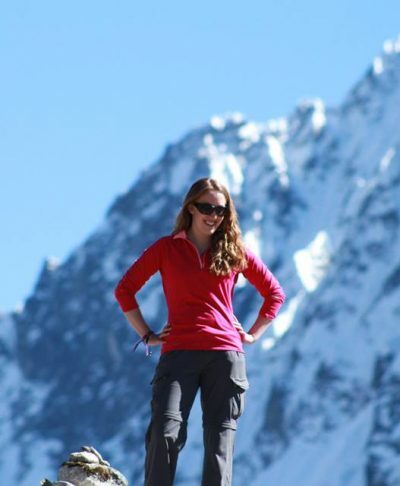 Let Our Expert Travel Advisers Help. Trip starts upon your arrival at the Cusco Airport. All international flights route through Lima. Depending on your flight schedule, you may need to overnight in Lima the night before your arrival in Cusco. A hotel in Lima can be added upon request. Trip ends at the Cusco Airport in time for you to catch your flights home, or continue on to the next part of your adventure. Trip Segment or Complete Package? 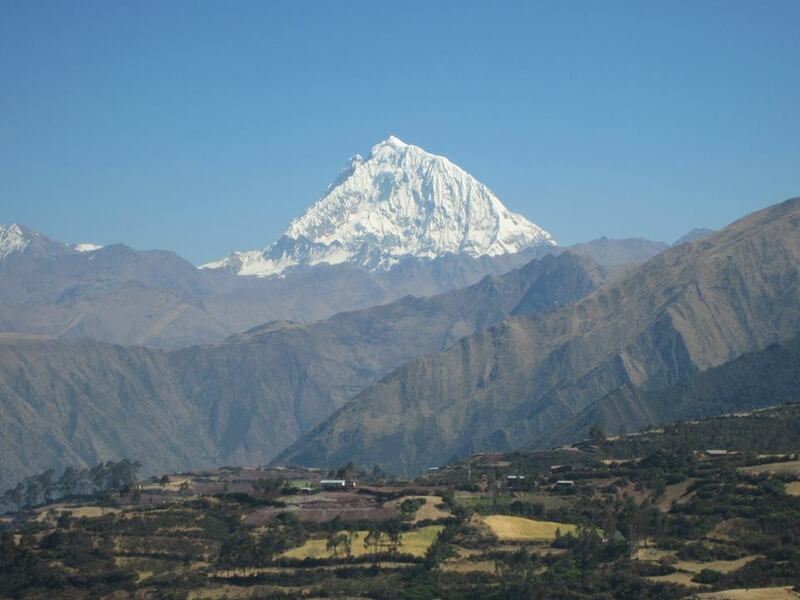 This trip is a complete packaged trip for Cusco, the Sacred Valley, the Salkantay Trek, and Machu Picchu. Depending on your flights, you may need to spend the night in Lima and we can help you arrange these services. We can also help you add to your journey with trips to the Amazon, Colca Canyon, Lake Titicaca, or the Galapagos Islands in Ecuador. Apu Salkantay is one of the tallest mountains in the area, and was considered a god by the Incas. This trek offers stunning views of the Andes peaks. Dramatic changes of scenery and ecosystems. 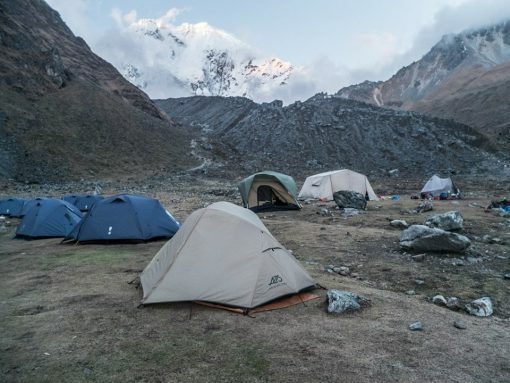 You’ll trek from the dry side of the mountains, hike along glacial lakes to a 15,000ft (4600m) pass, and then descend into the cloudforest and high jungle. You get a unique view of Machu Picchu. On the last day of the trek, you’ll arrive at the Inca ruins of Llactapata, and from here you can see the back side of Machu Picchu. 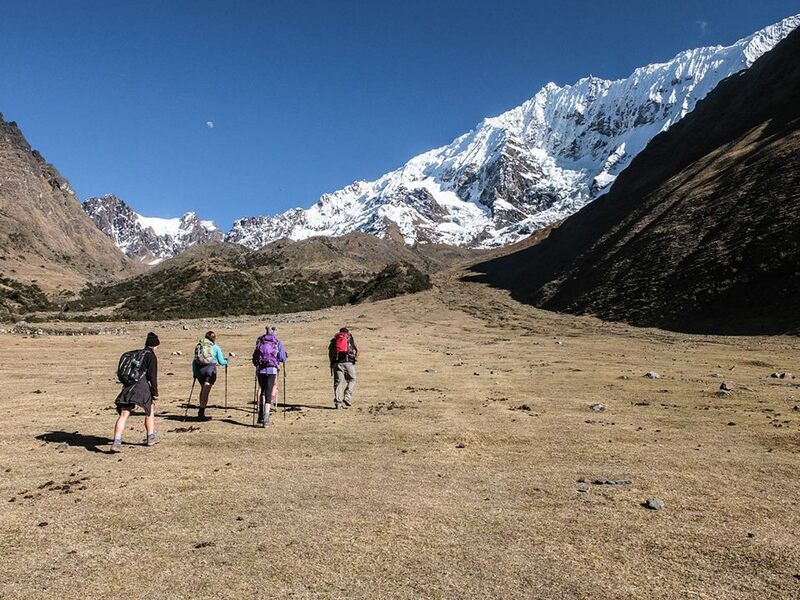 Arriving in Cusco a few days before the start of the Salkantay Trek, and doing warm up hikes in the Cusco and Sacred Valley area, is a great way to acclimatize and get a taste for the history and culture of the Incas. For more than three decades Amazonas Explorer has led high-quality trips and alternative adventures throughout South America. 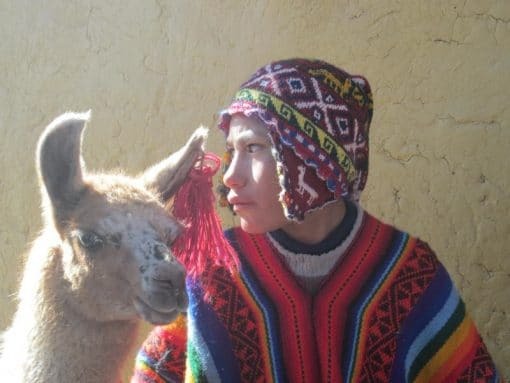 Based in Cusco, its professionally trained guides, cooks and support crew bring their passion and skills to the travelers they serve and, in turn, build rewarding careers for themselves. This talented staff of local experts is focused on providing you with safe and comfortable adventures, all centered on making your holiday as memorable as possible. The “Locals’ guide to Cusco” tour : On arrival at the airport, you will be met and escorted to your hotel. After some time to check in we introduce you to our city with the “Locals’ guide to Cusco”. This short walking tour is a great way to get your bearings and also helps you get used to the altitude. The beautiful historic centre was declared a World Heritage Site in 1983 with Inca and colonial architecture evident all around. This evening your guide will give you a full briefing for the adventure ahead. 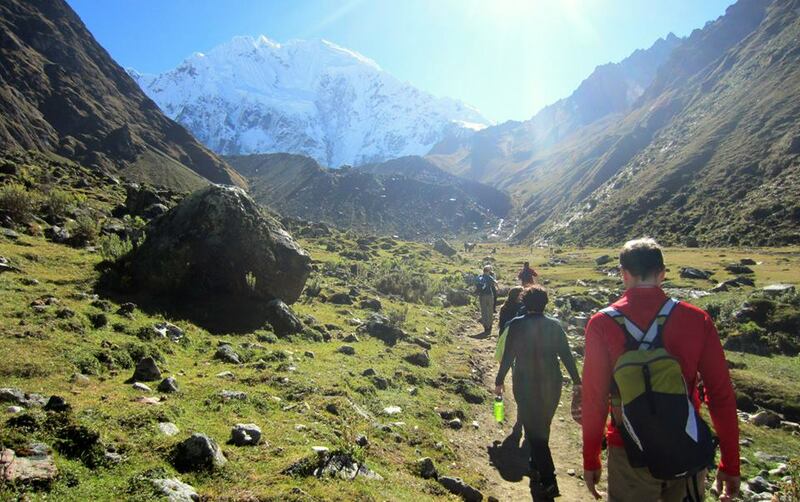 Today you stretch your legs with a delightful hike in the hills above Cusco. First you visit the impressive site of Sacsayhuaman. Huge stone ramparts surround a beautiful grass amphitheatre. Once the scene of fierce battles it now hosts the annual re-enactment of traditional Inca ceremonies such as Inti Raymi and Warachikuy. Sundays also see families from Cusco head up here to play, fly kites and dig the traditional huatias, a method of cooking potatoes in the ground. Next is the Inca water temple of Tambo Machay lying at 3700m (12,000 feet) followed by a special picnic lunch. 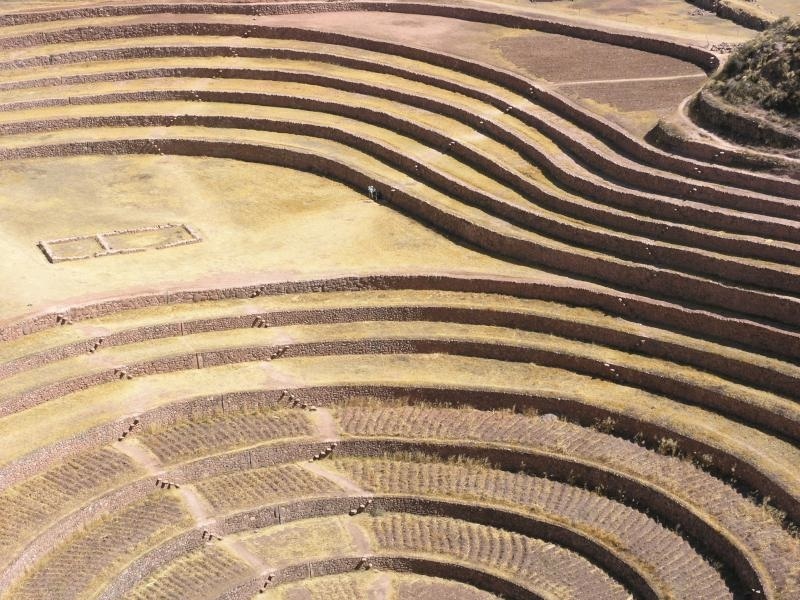 A trail through the fields leads you to the intricately carved Inca Temple of the Moon. From here a beautifully preserved section of royal Inca Trail leads you down into the old San Blas district, home to the city’s artists and finally into the Plaza de Armas. Leaving Cusco behind you start your journey to Machu Picchu. The hike starts at the fascinating circular ruins of Moray. While some think it was a landing pad for alien spaceships, most agree the Incas built this as an experimental agricultural center. Concentric circular terraces allowed them to simulate different facing slopes and different growing temperatures to see which crops would grow where. They then used this knowledge to cultivate the varied terrain of their vast empire providing abundant amounts of food to feed the people. After exploring Moray you take a mainly downhill trail through the fields. Depending on the time of year, you may have a chance to stop and chat with local farmers digging their fields of corn or planting potatoes. Perhaps you could have a go with the hand tools that have been used for centuries. Along the way you stop for a for a homemade picnic with marvelous views across to the snow capped Viilcanota mountains before carrying on down to the spectacular salt pans of Maras. Here you can stop and watch as local families extract the salt by hand, much as they have done for centuries. 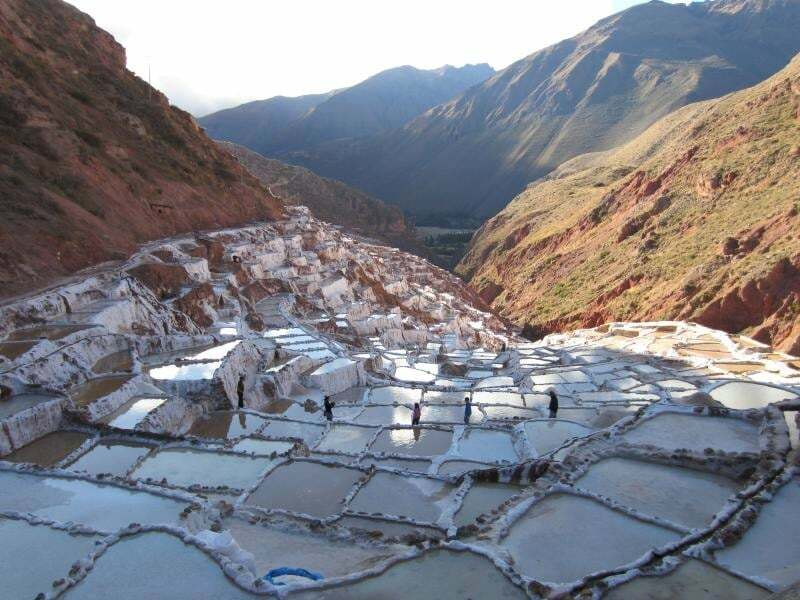 You could even buy some of the famous Maras Pink Salt as a souvenir. Finally you take the old track down to the Sacred Valley, where once llamas, then horses carried out the salt to be sent across the empire. Your support vehicle is on hand most of the day, should anyone prefer to take a ride rather than walk at any point. Departing your hotel early we enjoy a spectacular drive across the Anta plains and down towards the Apurimac valley, before climbing up to the small town of Mollepata and continue on to Soraypampa. We then meet our muleteers and start is a great acclimatisation hike to a beautiful mountain lake and a chance to stretch our legs before we head to our campsite on the large Soraypampa plain. A beautiful but tough day’s hiking, as we climb out of the Mollepata valley on a steep winding trail that slowly ascends to the highest point of the trek at 4650m. Weather permitting we will have spectacular views of the snowy glaciers of Salcantay. With frequent stops to allow time to acclimatize, we hope to cross the pass before the weather closes in and start our climb back down to Huayracmachay – “The windy place”. We continue further down the valley to Andenes and a slightly more sheltered campsite. A largely downhill hike today as we descend along an ancient mule trail. The vegetation gets lusher with every footstep as we drop into the “eyebrow of the jungle” and through the cloud forest to the small community of Colcapata. We can find all sorts of jungle produce along the way – this valley is one of the best coffee producing regions of Southern Peru as well as growing coca, papayas, oranges and other jungle fruits. Further down we meet our first signs of “civilization” in the form of the odd coca-cola and beer stall. We cross several small streams and finally arrive at Playa. This is our chance to grab a cold drink before the short hike along the road to Lucmabamba, where we camp beside some original Inca terraces. Time permitting there may be a chance to catch a taxi down to the small town of Santa Teresa, which boasts gorgeous hot-springs. Our final day of hiking takes us through the lush vegetation of coffee and tropical fruit plantations and up into pristine cloud forest. We follow an ancient Inca trail to Llactapata, an Inca site that has only recently been excavated. We will also have a truly amazing view of Machu Picchu that few tourists get to see, in our unique location from behind. We descend to the Urubamba valley to the hydroelectric plant from where a short, but spectacular train journey brings us to the bustling tourist town now known as Machu Picchu Pueblo. Here we check into our hotel and enjoy a shower before heading out to sample one of the many restaurants and bars. 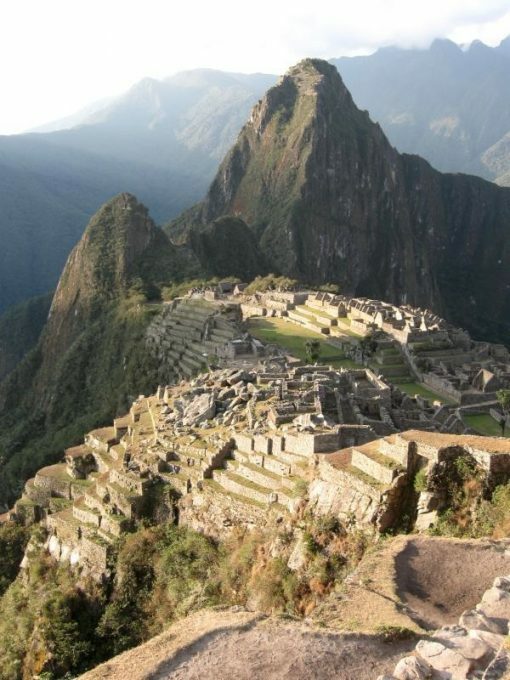 Today you explore the pinnacle of Inca engineering – Machu Picchu. This astounding site lies in an even more astonishing location. Perched high on an inaccessible hilltop it is protected by huge cliffs and the raging Urubamba river. Things are slightly easier now than in the time of the Incas and so you start your day with a twenty minute bus ride up to the site. You will arrive early, allowing you to explore the ruins in the company of your guide, before they get too busy. 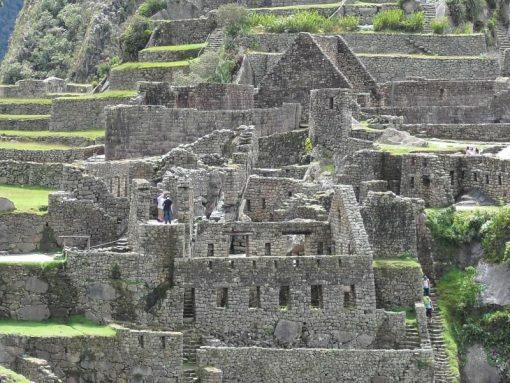 The guided tour takes around two hours leaving you a few hours free to wander amongst the old Inca walls and just sit and take in the scale of the place on your own. 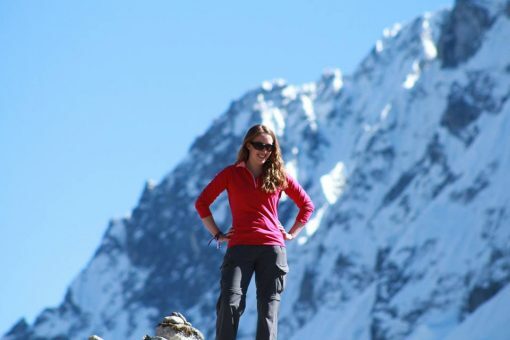 For those who want to walk a bit more, you could take the hour long trail up to the Sun Gate, or a shorter trail to visit the Inca Bridge which once spanned a sheer cliff face. Eventually the time comes to catch the bus down to Machu Picchu Pueblo and board your train back along the Urubamba River. The scenery is beautiful and the train jolts softly along, allowing you to sit, stare out the window and reflect on a wonderful week. Back once more in the old Inca capital you have time to enjoy all that this city has to offer. Museums, chocolate making classes, souvenir hunting or even just sitting in one of the many cafes and watching the world go by. The new late flights out of Cusco allow you to really maximize your time and get the most out of this holiday of a lifetime. 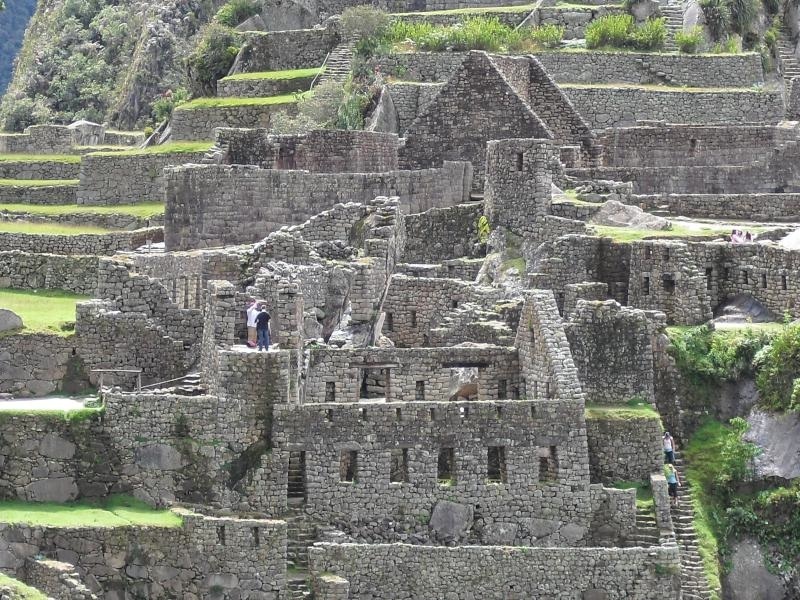 You will need to arrive in Cusco on Day 1 of this trip. You can arrive at any time this day, by flight, train, or bus. You will be met by your guide upon your arrival, and transferred to your hotel in Cusco. All international flights to Cusco must route through Lima. Most likely, you will need to overnight in Lima the night before you fly to Cusco. We can help you arrange a hotel and transfer services upon your request. At the end of this trip on Day 9, you will be transferred to the Cusco Airport, train station, or bus terminal in time for your departure. We can also help you add to your journey with trips to the Amazon, Colca Canyon, Lake Titicaca, the Galapagos Islands in Ecuador, or any other destination in South America. We do not sell international or domestic Peru airfare but partner with a flight specialty company, Exito Travel, who can arrange all of your flights for you, simplifying the process of this part of your trip. Trip Start: Trip starts upon your arrival at the Cusco Airport. All international flights route through Lima. Depending on your flight schedule, you may need to overnight in Lima the night before your arrival in Cusco. A hotel in Lima can be added upon request. Trip End: Trip ends at the Cusco Airport in time for you to catch your flights home, or continue on to the next part of your adventure. This trip is a complete package, starting and ending in the Cusco Airport. International and domestic Peru flights are not included, but can be booked through our travel partner Exito Travel. Depending on your flight schedule, you may need to overnight in Lima. We can help you arrange a hotel and transfer services if this is necessary. We can also help you add to your journey with trips to the Amazon, Colca Canyon, Lake Titicaca, the Galapagos Islands in Ecuador, or any other destination in South America. Pricing is per person, and based on double or triple accommodations. For 2020 pricing, please inquire using the “I am Interested” button above or by calling 1-866-386-4168. Private trips can begin on any date, March through December. There are no set family departures. All departures are open to families to join. Private trips are also available to start on any day with a minimum of 2 travelers. Gear includes spacious two person tents or single tents, dining tent, cook tent, portable camp toilet, and toilet tent. All camping and cooking equipment including Therm-a-rest inflatable mattresses, camping stools, tables, utensils, etc. Sleeping bags and pillows are not included, but can be rented upon request. Bowls of hot water are supplied in the morning and in the evening at camp. Clean hand washing water is available in camp. Filtered water is available in camp and at meal times (please bring a refillable water bottle).